In 1963, Englishman Peter McFarlane embarked on research and development of a process that would effectively renovate centuries old chimneys for modern use. Working closely with Great Britain’s National Coal Board, Peter introduced the cast-in-place chimney lining system. 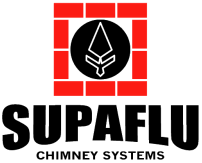 Since 1965, Supaflu has been the preferred restoration for tens of thousands of damaged chimneys in Europe and North America, including the Queen’s Palace. 1963: Peter McFarland begins development of a poured flue liner system. 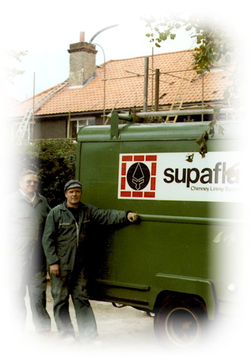 1965: First Installation of Supaflu in U.K.
1980: Current Supaflu Owner/President Fred Howes purchases on of the first Supaflu franchise in Maine. 1996: Manufacturing facility moved to Scarborough, Maine from Walton, New York. I wanted to write and tell you what a wonderful job the crew did at our house last week. They were very professional and personable. They kept us informed on what they were doing and took the time to answer questions we may have had. They also did a fantastic job of cleaning up at the end of each work day. Please extend our thanks to them and feel free to use us as a reference in the future. We would recommend your Company to anyone that needs chimney lining to be completed. We are very happy with the work. If you should need a reference please feel free to contact us." Terrific, knowing the chimney is safe and sound now - after a long time worrying about it! I cannot say enough about how impressed I was with your crew's professional manner."